Freightliner is introducing new 102-tonne MWA box wagons for an aggregates contract that use recycled components from redundant 102-tonne HHA bogie hoppers. 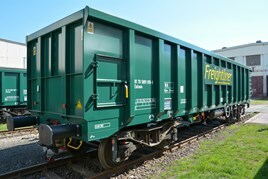 The freight company is the first UK rail operator to introduce European standards compliant box wagons using recycled materials. It is taking delivery of 23 MWAs. Freightliner Heavy Haul will use the wagons on a newly-won contract with Tarmac. With expertise provided by Greenbrier Europe, investigations confirmed that HHAs made redundant following the decline in coal traffic could be used with some modifications. Their bogies and some brake equipment was compatible with an existing box wagon already produced by Greenbrier. From November last year, Freightliner Maintenance Ltd (FML) recovered and modified bogies which were dispatched to Greenbrier in Poland using Freightliner Road Services. The MWAs were completed in Poland and the first have been delivered to the UK. FLHH worked with the Office of Rail and Road to ensure the wagons were compliant. To read about the decline in rail freight, read RAIL 802, published on June 8.